Just returning from a month away from SF & America and it makes me appreciate it all the more. – Our weather rocks. I love putting on a hoodie, layering, whatever we do here to manage the slight variations in cold. – First day back I walked up to a cafe, met a friend, and sat down to a long Scrabble game over beer. It’s a pedestrian city! We enjoy our casual cafes and don’t have weird alcohol restrictions. It’s a small, but urban city! Yay. – A big cup of coffee and a not-too-sweet cinnamon roll for under $5. Our food is so high quality and so well priced! – Bought a honeydew melon and oranges, in mid winter, for a few dollars. It was perfect. The oranges are sweet and heavy, the melon was ripe and tasty. – You can eat so many different ethnic foods, at so many places, for so little. Not long ago, you could only make a film if you had access to money for expensive equipment and other resources. But today, high-quality digital video cameras are inexpensive enough for almost anybody to purchase, and beyond that, video-capture technology is getting better on devices many people already own, like cell phones and point-and-shoot camera. In other words, you can be a filmmaker, starting today, with nothing more than your cell phone. That’s the message that Eric Slatkin and Carlton Evans want to get out with their Disposable Film Festival, which opens tonight at the Roxie with a competitive program of shorts, and continues with a single program each day through the weekend. Each program showcases film made with “disposable media,” which, according to Slatkin, is “video footage captured on these new alternative devices — the cell phone, the web cam, the point-and-shoot camera,” as well as a whole new generation of inexpensive video cameras, such as the Creative Vado, the Flip Video Ultra, and the Kodak Zi6. Because the media is “disposable” — footage costs nothing more than a little battery power, and can be thrown out instantly — Slatkin and Evans see a strong shift towards experimentation. Filmmakers are doing things one could never do with expensive equipment, such as on-the-fly shooting and kinetic filming. They believe that all this experimentation will inevitably influence mainstream filmmaking. In fact, it already has. Evans cited Cloverfield, which was presented as found footage from a camcorder, as an example of this influence. “This is an aesthetic that everybody understands right away,” he said. Some people are already masterful in the form, such as Fritz Donnelly, who will have an evening devoted to his work Saturday night at ATA. “He was a disposable filmmaker before it was even a ‘thing,’ ” Evans said. “I first saw his work in the Hi/Lo Festival,” which is a festival devoted to high-concept-low-budget films. Later on, Evans met him at SXSW, and in November Donnelly showed Evans and Slatkin the films he’d recently been making with his cell phone. A lot of Donnelly’s films are quick sketches created on the spot whenever he has an idea. “He had been carrying around this DV cam, but now he just uses his phone,” Evans said. On Friday night, also at ATA, the festival features Buttons, by Red Bucket Films, which is a feature-length collection of tiny vignettes from real life, a kind of impressionistic sketchbook portrait of New York City. “These guys are true filmmakers,” Slatkin said, “and sometimes there’s a magic poignancy they reach” in these moments. Tonight’s program, at the Roxie, consists of twenty-five short films shown over an hour and twenty minutes. (The first screening has already sold out, but they have added a screening at 10:00.) These films were selected from about 300 submissions. “The thing that was most amazing about it,” Evans said, “is that about 30 different countries were represented in that.” In the final program, there are films from Poland, Ukraine, Brazil, Portugal, and other countries in addition to the US and Canada. In case you can’t make it, all the shorts will eventually be featured on the DFF website, but Slatkin says they have continued to put on shows at traditional venues because “there are real limitations in viewing a creative work online.” According to Slatkin, films shown in a theater tend to have more of an emotional impact on the viewer, because of the large screen, the darkened room, and the communal nature of the experience. Finally, on Sunday at noon, the festival will present a panel hosted at Oddball Films at 275 Capp Street. The panel will discuss how you can get into disposable filmmaking yourself, addressing all the basic details of equipment and editing software. And if you happen to take that information and make a film you’d like to enter in the festival for next year, submissions will open in March or April. Watch their website for details. The Owl and the Sparrow, which opens tonight in San Jose and on February 13th in San Francisco, tells a simple story: Thuy, an orphaned 10-year-old girl, runs away from her overbearing uncle in the countryside and tries to make a new life for herself in Saigon. While selling postcards and flowers, she meets and befriends a zookeeper whose fiance has left him, and a beautiful flight attendant who is about to break off her affair with a married pilot. Eventually she gets the idea of bringing these two lonely hearts together, creating a makeshift family of her own, which will soon collide with the authorities and with her uncle, who has been searching the city for her. Bui and Gauger (pronounced GOW-ger) have known one another for many years now, ever since Gauger’s student days at Cal State Fullerton. Since then they’ve worked together on five feature films, but The Owl and the Sparrow is Gauger’s first stint as director. This weekend marks its first theatrical release in the United States, but on the festival circuit it has won about ten awards — including the award for Best Narrative Feature at last year’s International Asian American Film Festival — and it has had a few screenings overseas as well, including in Vietnam. I asked how it played there. There are a lot of kids in Saigon just like Thuy, who are selling things just to survive. Most of them have family in the countryside, often rice farmers, who don’t make much money. It’s common for kids to stay with relatives in the city, and while they sometimes go to school during the day, they always work at night, selling jewelry beads or postcards or flowers, and then send a little money back home when they can, to try and help out. The only actor who was not auditioned at the time was Cat Ly, who plays the flight attendant. Cat Ly is American-Vietnamese, and she’s actually a known singer in the community. Bui said that she acted in his first student film, 15 years ago, and then he lost track of her for ten years until she appeared in Journey from the Fall. “I was a gaffer on that film,” Gauger said, “and we hung out. I liked her acting style in that film.” So, back in Orange County, he asked her out to grab some pho, and he described his project to her: fast, with no time to rehearse, and he couldn’t pay her much, but it would be an adventure. Why did she say yes? Gauger thinks that it was the opportunity to do a “nice role” and work with “somebody who is a little bit not the norm, who’s not going to play it safe,” offering her a chance to express herself. “It’s a good challenge,” he said. In the meantime, enjoy the Owl and the Sparrow, which opens tonight at the Camera 3 in San Jose, and on February 13th at the Sundance Kabuki. The Giants announced yesterday they have re-signed relief pitcher Jack Taschner to a one-year contract. As Giants fans know, the team picked up two interesting free agents over the winter: infielder Edgar Renteria and pitcher Randy Johnson. While Renteria is a typical free-agent signing — a well-known player who may have two or three years left in him — Johnson is more intriguing. The 295 game winner may be 45 years old, but he won 11 games last year and, as many have pointed out, just having him on the roster means there are four or five games the Giants won’t lose this year, as he invariably beat them when pitching for the Diamondbacks. With the addition of Johnson, the team is still looking for a big bat. Irascible Jeff Kent will retire tomorrow rather than face another season. Kent, 40, has seen his production slide in the last two years. Omar Visquel, who last played for the Giants but whom the Giants informed they will not re-sign, is expected to sign with the Texas Rangers. SF: are we dog friendly or not? One of the reasons I love San Francisco so much is because it is so dog-gone friendly. I am a huge fan of dogs, they have been apart of my family my whole life. 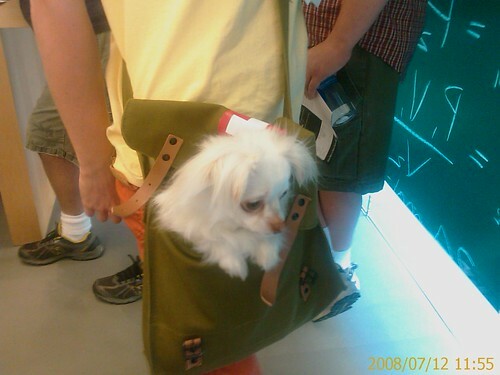 I take my chihuahua Funston with me everywhere I can, and when I can’t, I conveniently pop him into a bag. I first discovered that I could take dogs into some bars in SF when I visited one of my favorite establishments, Bender’s Bar & Grill on S Van Ness. A large mastiff Sweet Pea frequents the joint along with other regulars. I took Funston there to meet up with Ridley and they happily hung out as we downed our beer. I spoke to barista Jeremy about the sign and he explained that a couple of people complained to the health department and now he can’t even bring his own very well behaved dog in. He lost one of those intrinsic job perks that keeps him motivated. 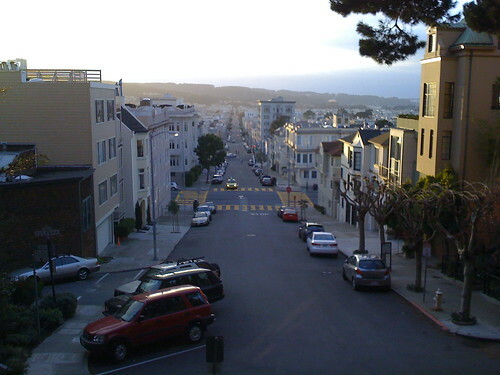 The Mission is a very walkable part of San Francisco and you see people with their pooches out all the time. Eric and Mark and doggie Karl came by Four Barrel expecting to go right in, but stopped when they saw the new sign. Eric had to wait outside while Mark got them coffee and Karl was left confused. It seems pretty overboard to complain about people bringing their dogs into grab some coffee. The floor at Four Barrel is cement and the coffee and the donuts being served can’t be accessed by dogs. The only explanations I can think of are that some people are allergic and/or a dog got up in the face of a non-dog friendly patron. I’m not sure how to resolve this to everyone’s satisfaction. Clearly there are the dog lovers, and the not so much. So we don’t continue with the negative trend, I ask San Francisco dog owners to please keep your dog in check if you are going to take them into food establishments so the rest of us can enjoy this privilege. And for those of you that aren’t so dog friendly, have a heart. Nobody wants to see a sad dog!